Preheat grill to medium heat. With a paper towel, grease grill basket with 1 tsp coconut oil. Cut the tops off the peppers and pull out any easily reached seeds. Put the peppers in the grill basket and, stirring occasionally, grill until peppers are lightly blackened (or to desired doneness), about 20 minutes. Meanwhile, mix the light mayo and wasabi paste in a bowl. Refrigerate. Fold a paper towel and hold it with grilling tongs. Put the remaining tsp of coconut oil on the paper towel and grease the grill grates. 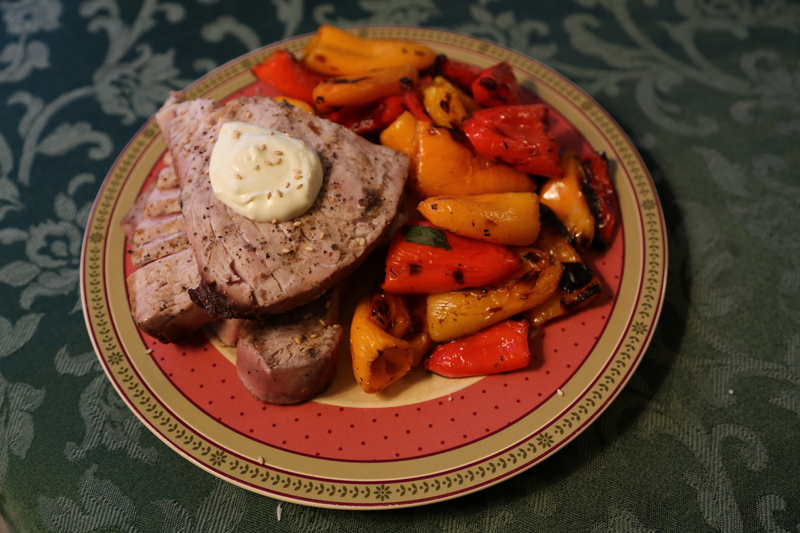 Sprinkle tuna steaks on both sides with black pepper. For seared tuna, grill 1 minute per side. Otherwise, watch the sides of the tuna steak to gauge desired temperature. When no pink remains on the sides, your steak should be cooked through. Serve with grilled peppers and a dollop of wasabi mayo. This meal includes an entrée and a veggie side. 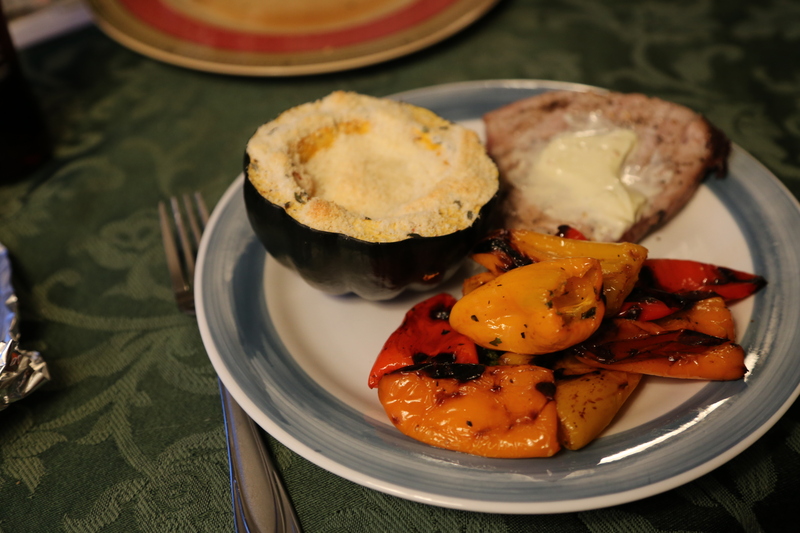 We also made a starch side, the Savory Acorn Squash Bowls, but they’re already posted under Healthy Harvest Recipes. Plus, they’re a more common staple in our home. I just wanted something easy and low fat to go with the tuna. As I mentioned in Poke Your Eye Out, very good tuna is very expensive. However, the nice thing about tuna is that it’s loaded with protein and very low in fat (.26g of fat per ounce). What can compete with that? Even beef jerky has .5g per ounce. Be very careful when throwing the tuna steaks on the grill. In case you don’t know, seared tuna means it’s very slightly cooked on the top and bottom of the steak, but most of the inside of the steak is still very pink. If that’s not your thing, cook it longer. But don’t over cook it! I can’t stress that enough. If you do, you might as well be eating tuna out of a can. Please comment if you know other low fat sources of protein. All of us lactards (or nursing mommies with lactose intolerant children) are, or should be, interested.